Few American epics of tragedy, intrigue, friendship, and faith will entertain and challenge the soul like the narrative inspired by the events in the real life of David Ring--a boy literally born dead who survives with sobering consequences. Living with the harsh realities of cerebral palsy, Ring faces impossible odds yet stumbles into an improbable life of inspiration and influence in the small, unassuming town of Liberty, Missouri, in the 1960s. As a teenage boy, Ring finds himself tragically orphaned and being shuffled about to various homes. Along this journey, he faces secret, unspeakable atrocities that eventually plunge him into the depths of depression and attempted suicide. But amid the harsh troubles of life, he encounters another boy his age named David, the son of a local pastor. Their unlikely friendship begins on the rocks, but eventually develops into something extraordinary and unique that alters the trajectory of both of their lives--and the whole town of Liberty--forever. About "The Boy Born Dead: A Story of Friendship, Courage, and Triumph"
David Ring has been an internationally known speaker since 1973, sharing his story with over 100,000 people each year at churches, conventions, schools, and corporate events. He is frequently featured on national television outlets, such as TBN's Praise the Lord,nbsp;The Old-Time Gospel Hour with Dr. Jerry Falwell, and Focus on the Family. He and his wife, Karen, live in Nashville, Tennessee. Theynbsp;have four children and three grandchildren. John Driver is a husband, father, pastor, author, and songwriter. He lives with his wife, Laura, and their young daughter, Sadie. David Widemannbsp;has been a pastor at Christ Journey Church in Coral Gables, Florida, since 1983.nbsp;As executive pastor for campus operations, he oversees the finances, facilities, and staffing for a multi-campus church reachingnbsp;thousands on physical campuses and online.nbsp;He and his wife, Jenna, have two adult children and live in Miami, Florida. 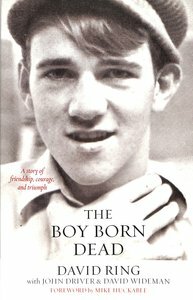 Customer Reviews For "The Boy Born Dead: A Story of Friendship, Courage, and Triumph"
VERY REAL, HONEST AND MOVING TESTIMONY. I could picture everything so very clearly such that painful events in David Ring's life left me aching and breakthroughs brought me a surreal joy. A poignant testimony of God working out His purpose in brokenness. It is very well written, lots of tangents, but they all had a purpose that pulled together the overall picture. If you like this testimony I suggest listening to "Miracle for Jen". Another powerful testimony of God working through adversity.